168 articoli pubblicati con la parola (s) o la frase Esprit in Notizie, Tendenze, Video, Gallerie fotografiche, Agenda e ordinati per "data discendente". Gucci, Etam, Sonia Rykiel, Kickers… Marchi molto diversi tra loro che questa primavera si sono appropriati delle tematiche del movimento di protesta che 50 anni fa cambiò la società. In che forma e con quale legittimità? ...Esprit on Tuesday posted a bigger loss for the first half amid changes in consumer behaviour, price competition and reduced customer traffic across its distribution channels due to weakness of its brand. ...rivals such as H&M and Inditex. The tough conditions in the German retail market have also hit similar labels including Esprit and Tom Tailor, as consumer spending on clothing remains flat. ...retailer’s range includes footwear and accessories for men and women. Available brands include Australian, Café Moda, Esprit, Puma and Tamaris. ...Days after announcing a new wholesale director, Esprit has appointed Simon Heckscher as head of global marketing with immediate effect. ...moda ahora cuenta con un nuevo comité ejecutivo para enfrentar la crisis por la que pasa. Gursu ha trabajado en Mango y Esprit. ...como H&M e Inditex. Las duras condiciones en el mercado alemán del retail también han afectado a marcas similares como Esprit y Tom Tailor, ya que el gasto de los consumidores en ropa permanece plano. ...estatus icónico de los años 80 y hacerse conocida por crear "productos, experiencias y una marca que levante el espíritu". Esprit planea abrir 220 tiendas en China para 2023. ...Der Manager verlässt seine Position als Vertriebsleiter des deutschen Labels Esprit und wechselt zu dem portugiesischen Jeanshersteller. Er ersetzt Filipe Vila Nova, den Gründer von Salsa. ...Der in die roten Zahlen gerutschte Modekonzern Esprit streicht in Deutschland mindestens 400 Stellen. ...Esprit Holdings Limited hat heute seine Halbjahresergebnisse zum 31. Dezember 2018 veröffentlicht. ...Vertriebsstrukturen verantwortlich zeichnete. Davor war er viele Jahre in unterschiedlichen führenden Vertriebspositionen bei Esprit tätig. Künftig berichtet Dörner direkt an CEO Holzer. ...co-founder Chris Morton told Reuters.It has financial backing from Bernard Arnault, head of LVMH and the likes of DFJ Esprit and Accel Partners. ...Fashion brand Esprit has announced that Holger Thiesse is stepping down from his role as Senior Vice President and Head of Lifestyle after 14 years in the business to focus on other projects. ...Esprit сообщил о том, что спад продаж оказался сильнее, чем ожидалось, на фоне изменения потребительского поведения, конкуренции цен и уменьшения трафика по всем каналам дистрибуции из-за слабого положения бренда. ...работать сразу несколько известных одежных брендов, в частности, Karen Millen, Oviesse, New Look, Lindex, River Island, и Esprit. При этом летом 2017 года в Екатеринбурге открылся магазин французского бренда Kiabi. ...работать сразу несколько известных одежных брендов, в частности, Karen Millen, Oviesse, New Look, Lindex, River Island и Esprit. ...A Esprit iniciou uma auditoria das suas atividades após revelar resultados decepcionantes para o exercício 2017/18, marcados pela queda nas vendas e um produto que "já não corresponde às expectativas dos clientes". ...Ayakta kalmaya çalışan marka Esprit Holdings Ltd, rakip firma Inditex’in yönetiminden yaptığı yeni CEO transferiyle, iki ay önce istifa eden CEO’su ardından 1/3 ‘lük kaybettiği pazar değerini bir anda % 18 arttırdı. ...A Esprit iniciou uma auditoria das suas atividades após revelar resultados dececionantes para o exercício 2017/18, marcados pela queda nas vendas e um produto que "já não corresponde às expectativas dos clientes". ...​The news doesn't get any better for Esprit with the fashion giant saying that its fiscal first quarter was tough. And the warm summer weather continuing into early autumn seems to have been partly to blame. ...German clothing company Esprit announced “significant job cuts” in a letter to its employees last week. ...Esprit has launched a review of its business after revealing disappointing results for financial year 2017/18, driven by falling retail sales and product that “doesn’t meet customers’ expectations." ...estatus icónico de los años 80 y hacerse conocida por crear "productos, experiencias y una marca que levante el espíritu. 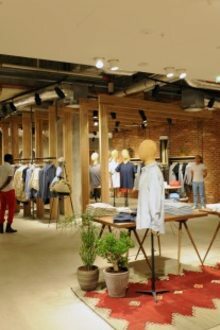 Esprit planea abrir 220 tiendas en China hacia 2023.